This past weekend went camping/fishing at pymatuning (PA side, sites J222 and J223) as we did last year. Fishing was better than last year from the site, but we were unable to secure a boat. We lucked out with the weather and had no rain. 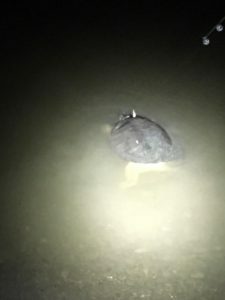 While the couple fish I caught were not anything special, I did manage to catch a snapping turtle while fishing for catfish. 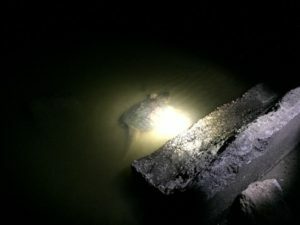 Estimated the shell was 16-18 inches. Caught using a piece of bratwurst. Sun is out. Ribs are on. 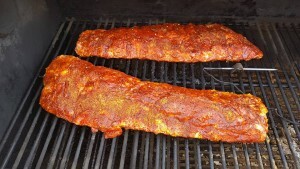 One rack is slathered with yellow mustard while the other got hot sauce. Both got a nice coating of BBQ Rub from Rebel Butcher Supply (106 Flowood Drive, Flowood, MS 39232). Run your tap water on hot till it gets as hot as it goes. Fill with three cups of water. Add dry yeast and salt to water and stir. Let sit 1 or 2 minutes. Weigh 2 lbs of flour. Mix in water/yeast/salt to flour until all flour is incorporated. Cover and let sit out for 4 to 12 hours. Refrigerate overnight. 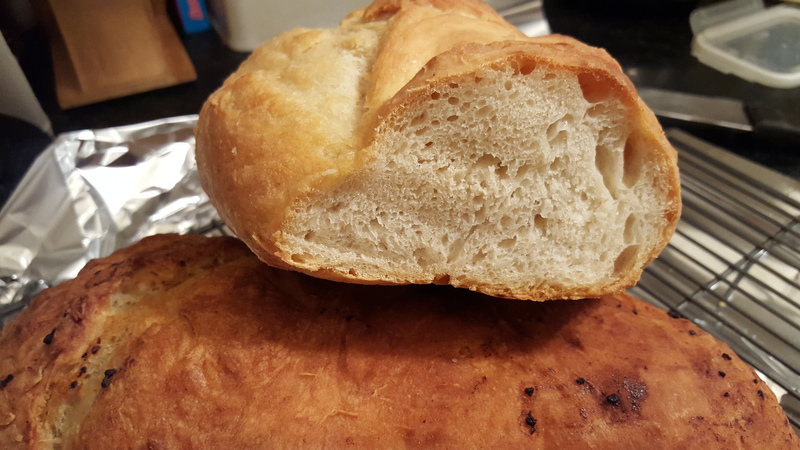 When ready to bake, allow dough to come to room temperature. Cut the dough in two. 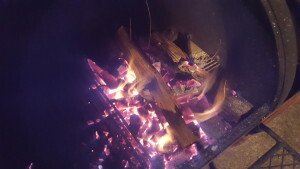 Put dutch oven in oven and preheat to 450 degrees (If your oven does not have a pre-heat timer, than give it a good 45 minutes). Spread some flour on a large cutting board or suitable work surface and form a loaf folding the dough over a couple times. Keep any seams on the bottom. Cut shallow slits across the top just scoring the surface. 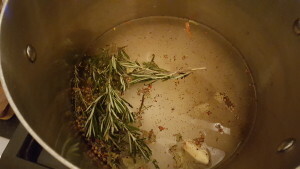 Remove the dutch oven and spay with oil. 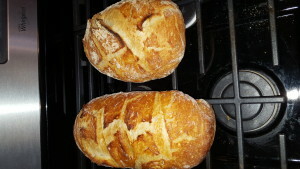 Put loaf in dutch oven and cover. 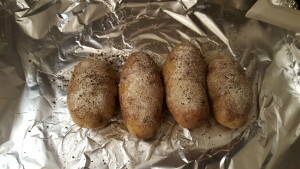 Put back into the oven and bake for 30 minutes. Remove the cover and bake for another 15-30 minutes until internal temp is at least 200. Repeat with the remaining dough or refrigerate until ready to use. 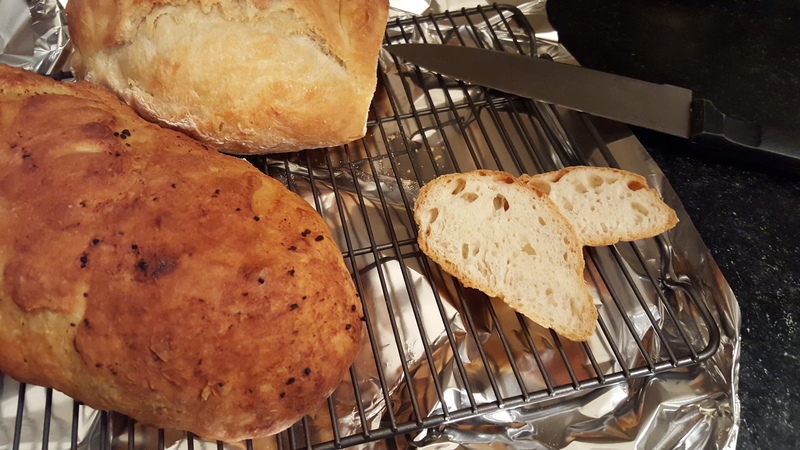 Let bread rest for an hour before slicing. 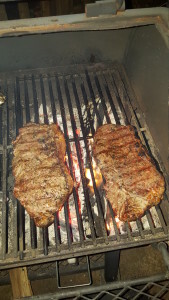 I am a big fan of strip steak. My choice at any steak shop. Excellent texture and taste. Look for cuts with lots of marbling. 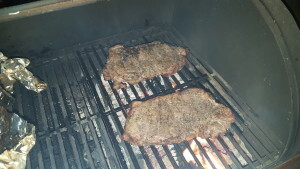 Cook offset till 110 then sear for a couple minutes each side. Offset means, no direct heat. 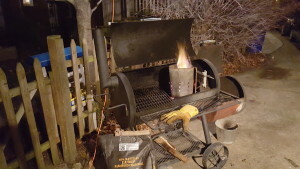 On the grill this is building the fire to one side and placing the steaks on the other. 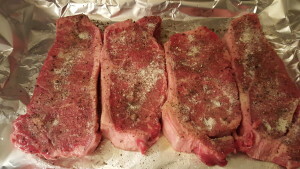 If done in the house, you would start the steaks in the oven at a really low temp, say 200 to 250. 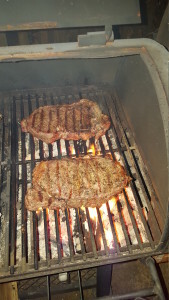 When they hit 110 or so, give them a rest and heat up a thick pan as hot as it can get, then sear. Always let the meat rest for a bit before cutting. Rest times will depend upon thickness, but in general you want the internal temp to start dropping rather than raising (also known as carry over). The above are our spices. 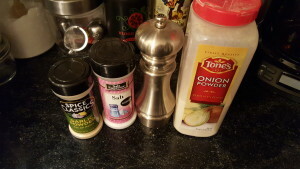 Powdered garlic and onion, kosher salt, and fresh ground pepper. Seasoned with SPOG, but wait there is more!!! Bacon never hurt anyone right? 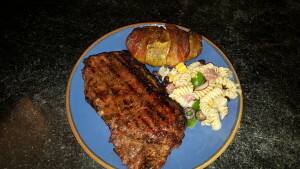 For the main course, as mentioned before strip steak seasoned once again with SPOG. 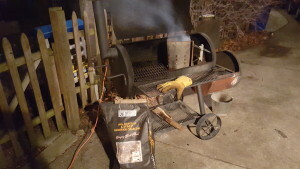 Let those items rest while getting the smoker going. 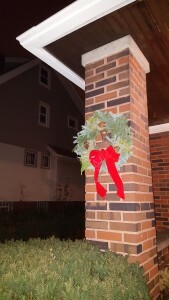 Chimney ready. But wait, there is more!!!! Why not add some small splits to it. Onto the pork-tatos. Those go on first. 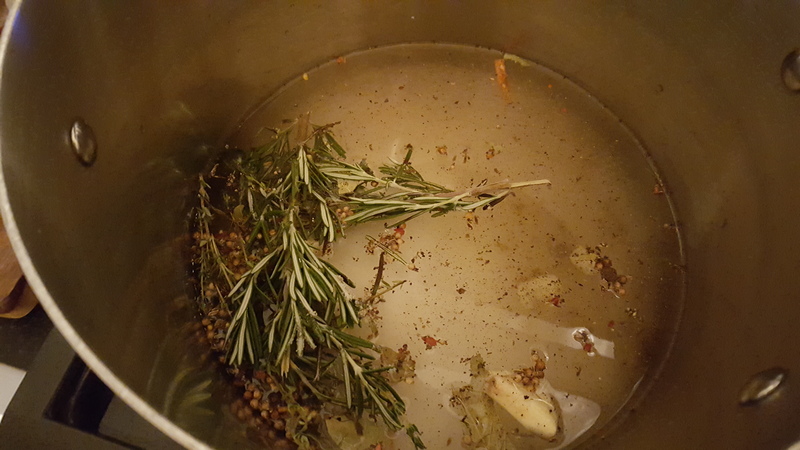 Close that lid and let it got for a bit (15-20 mins) then rotate. 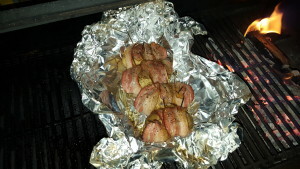 Want the bacon to render slowly and let the potato to slowly come up to temp. 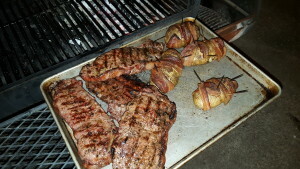 Move it closer, or farther away from the heat as needed to cook the potato and not overcook the bacon. Getting there. 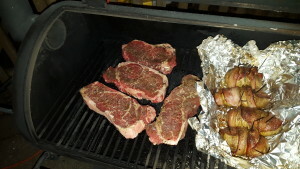 Time for the steaks to start. 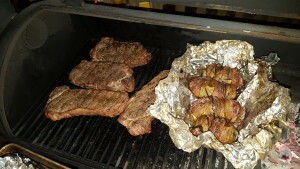 After 5 or so minutes flip the steaks and rotate the potatoes. 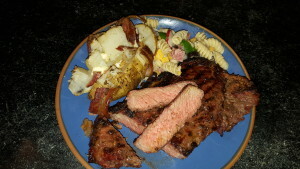 Best part is next, but you should probably check the internal temps of the steak at this point. Mine was reading 109. Which means time for a sear. 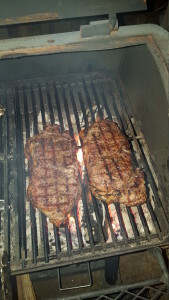 Couple minutes each side flipping and rotating to get the grill marks. About that time to rest and serve. Perfect medium rare which is how I prefer my strip steaks. 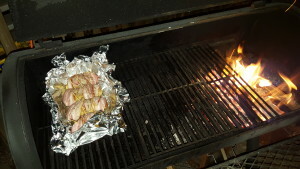 Secret Santa time on the bbq-brethen.com. 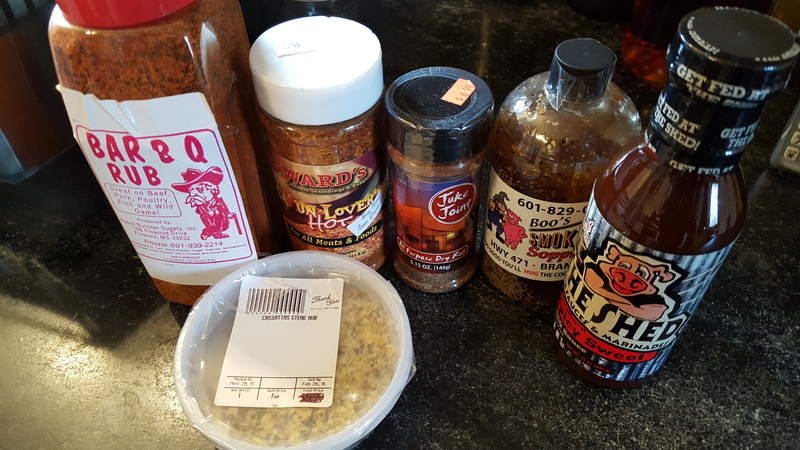 Got a real nice package of rubs and sauces. All of them local Mississippi products. 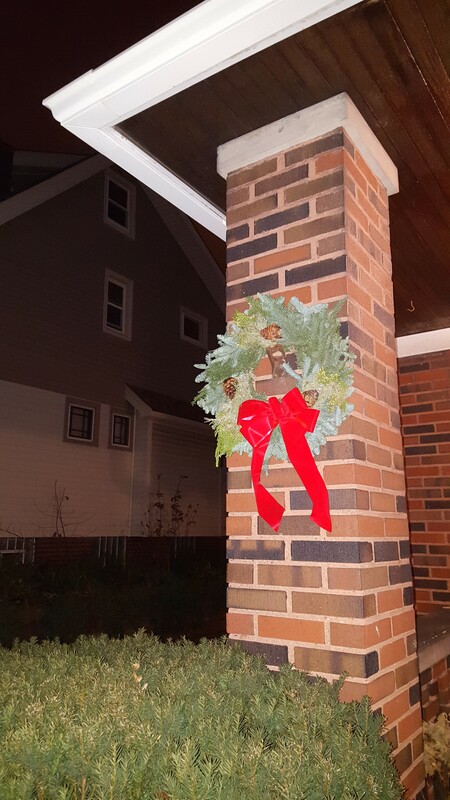 Found a gift on the porch last night. Time for these guys to take a nap. I think these are very seasonal colors. AKA the cure. 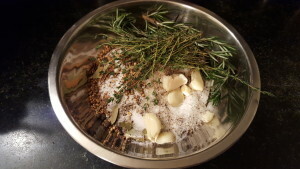 Salt, sugar, pink salt, pickling spices, pepper, rosemary, thyme, and of course garlic. Add that to almost one gallon of water and simmer until dissolved. Allow to cool. 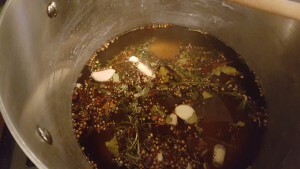 To speed this up I held out half the water and chilled it then added it to the brine to bring down the temp. 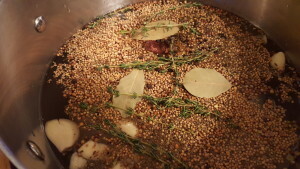 You want the brine to be chilled before adding it to the meat so it does not cook the meat. 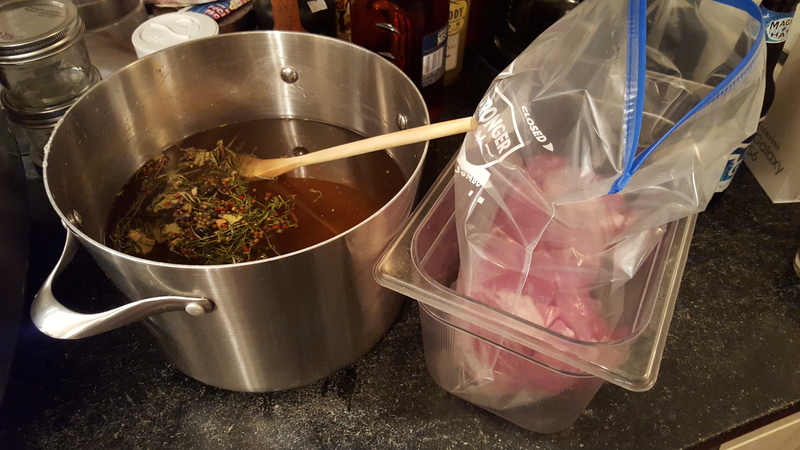 Once chilled ladle over the pork loin. 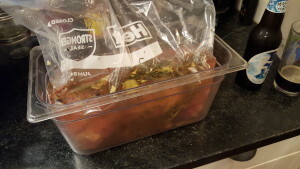 In this case I used a 2.5 gallon bag in a container in case of leakage. Put in the fridge for 48 hours. 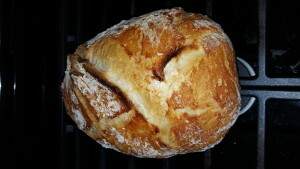 Wow, this could not be simpler, first the recipe comes from the no knead book, Artisan bread in five minutes. 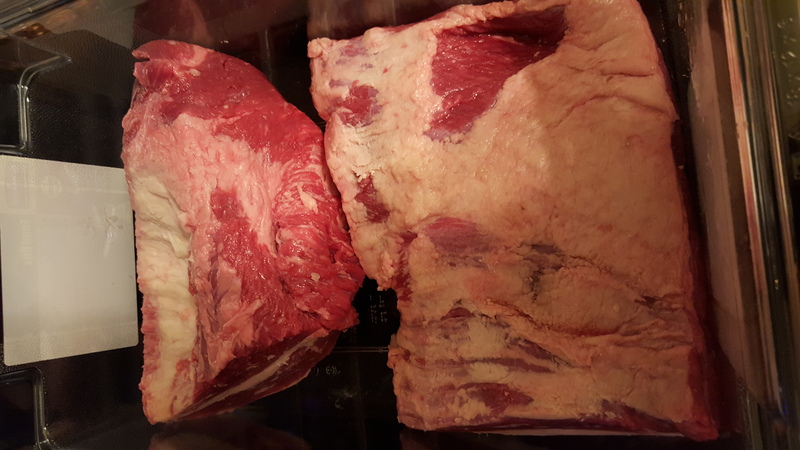 I had this small brisket in the fridge thawing for the weekend. 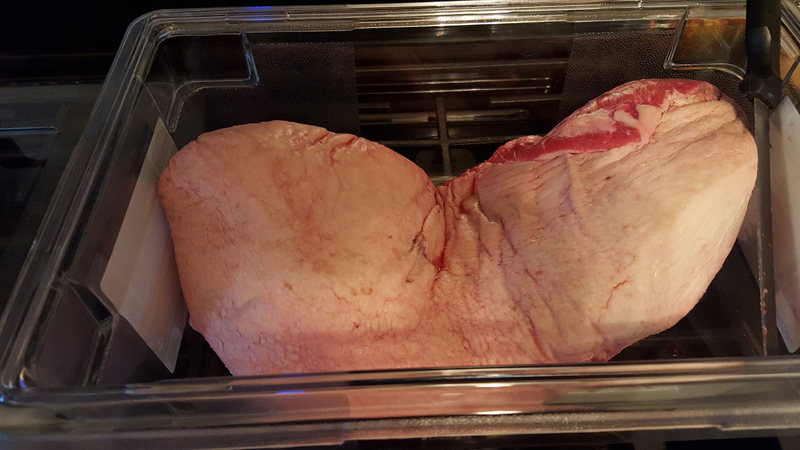 I was going to smoke it but instead I picked up a larger brisket to smoke next weekend (GFS – $2.39 per pound) and this smaller one is destined for corning. 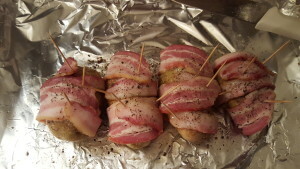 Recipe is from Michael Ruhlman’s book Charcuterie with some modifications. I added peppercorn, thyme, and bay leaves. 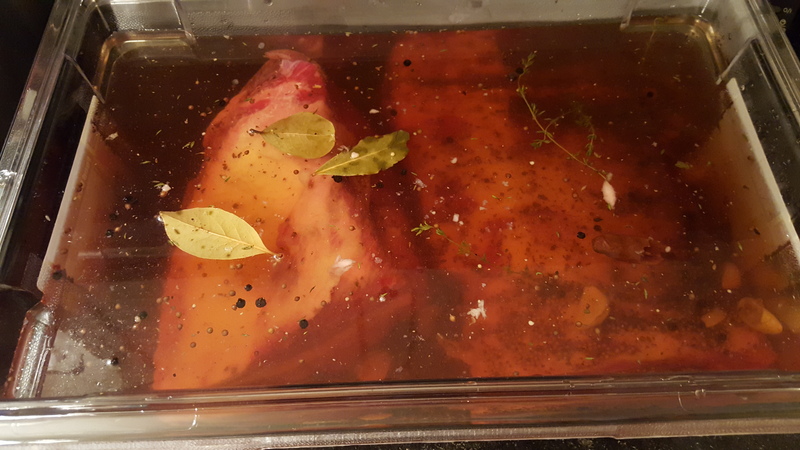 Picked up a 3.5 Gallon tub from Sam’s club to hold the beast while curing. 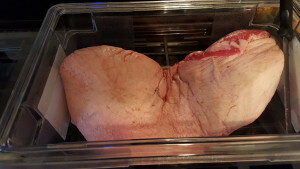 Brisket prior to trimming not really fitting. 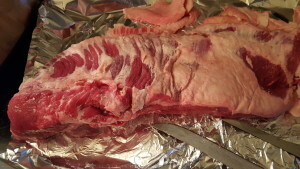 Trimmed some fat and cut in half. 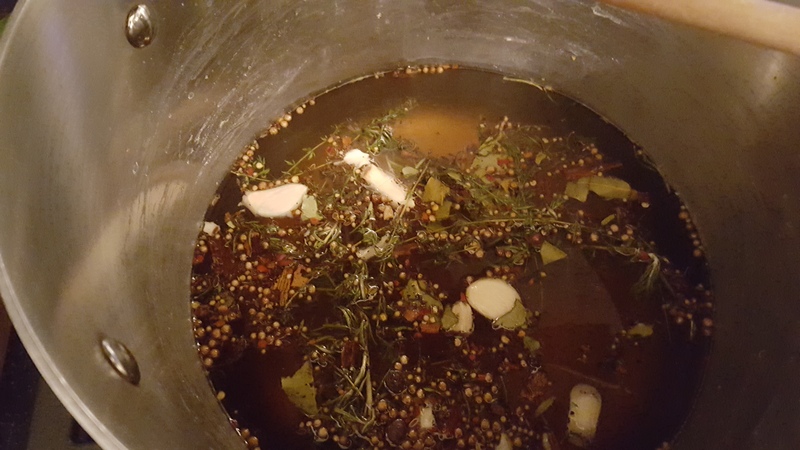 Made up 3 gallons of brine to make sure I had enough to cover. 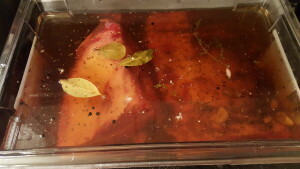 Brine brought to a boil than chilled outside till cool. 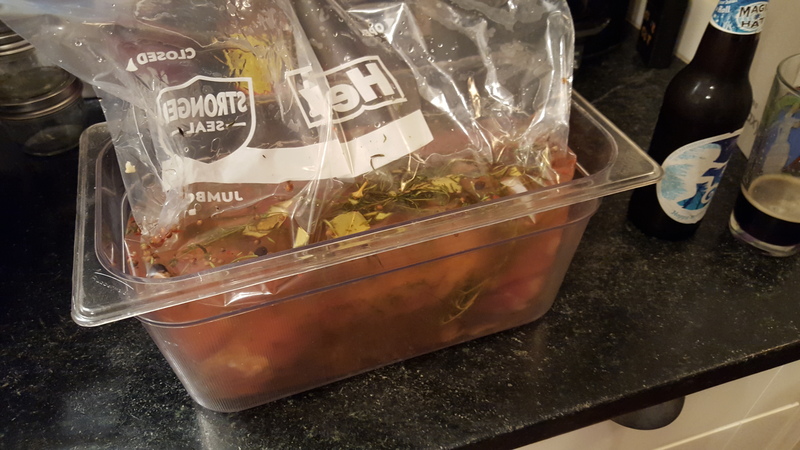 Brisket off for a sleep in the fridge for 5-6 days.